What type of assemblies or components do you need? We can manufacture sheet metal assemblies and components based on nearly any concept, drawing, or physical example to your design specifications. We can create the most complicated shapes out of many different materials because of our technology, advanced equipment and experienced staff. Since we have the most modern equipment to punch, form, perforate, laser cut, custom tool and stamp metal, our fabricated metal assemblies and components can be produced quickly, to a very high quality, and to your unique specifications. 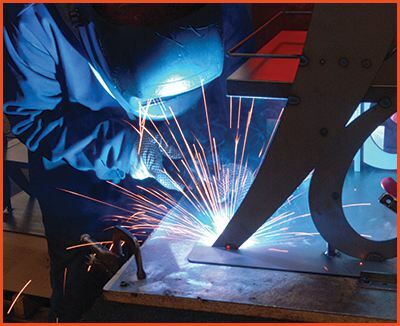 Our welding department excels at fabricating assemblies and components, offering a wide range of welding techniques from MIG, TIG, and spot welding. We even have a Motoman HP20D-6 DX100 robotic welder w/ Fronius Cold Metal Transfer MIG that can weld most metals, including aluminum, extremely accurately and much faster than conventional methods. 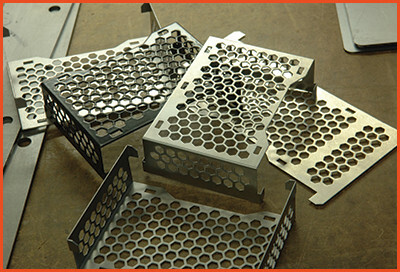 Do you need perforated metal assemblies or components? We also have the capability to perforate assemblies and components from most metals and then fabricate into most designs. 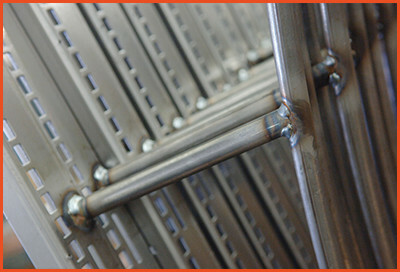 We can provide perforated metal with a range as light as 28 gauge up to 3/8 inch thickness. Whether you need a metal diffuser screen to precisely fit inside a lighting fixture or perforated hood for ventilation, we can supply them. We have dozens of perforating presses, hundreds of perforation tools in stock, and thousands of perforation patterns to choose from. Our equipment and facilities allow us to do medium or large production runs on sheet metal parts and blanks. We specialize in understanding what each company wants, forming it to meet specifications and meeting delivery deadlines so that you can keep your production lines running. Since the quality of any product is based on the quality of the components, our fabricated metal parts and blanks will ensure the best results for your final product.